Brazil nuts are high in calories, contain good quantities of vitamins, anti-oxidants, and minerals. Its kernels, in fact, have been major energy sources of native Amazonians even today. 100 g of brazil nuts provide about 656 calories. Their high caloric content chiefly comes from their fats. However, much of this fat content is monounsaturated fatty acids (MUFA) like palmitoleic acid (16:1) and oleic acid (18:1) that helps lower LDL or "bad cholesterol" and increase HDL or "good cholesterol" levels in the blood. Research studies suggest that Mediterranean diet that is rich in monounsaturated fatty acids offers protection from coronary artery disease and strokes by favoring healthy blood lipid profile. Brazil nuts are also a great source of vitamin-E; contain about 7.87 mg per 100 g (about 52% of RDA). Vitamin-E is a powerful lipid soluble antioxidant. It required for maintaining the integrity of mucosa and skin by protecting it from harmful oxygen-free radicals. Brazil nuts hold exceptionally high levels of selenium. 100 g nuts provide about 1917 µg, or 3485% of the recommended daily intake of selenium, rating them as the highest natural sources of this mineral. Selenium is an essential cofactor for the anti-oxidant enzyme, glutathione peroxidase. Just 1-2 nuts a day provides enough of this trace element. Adequate selenium in the diet can help prevent coronary artery disease, liver cirrhosis, and cancers. Furthermore, just as in almonds and pine nuts, brazil nuts too are free from gluten protein. For the same reason, they are one of the popular ingredients in the preparation of gluten-free food formulas. These formula preparations are, in fact, healthy alternatives in people with wheat food allergy and celiac disease. Additionally, these creamy Brazil nuts are an excellent source of the B-complex group of vitamins such as thiamin (51% of RDA per 100 g), riboflavin, niacin, pantothenic acid, vitamin B-6 (pyridoxine), and folates. Altogether, these vitamins work as co-factors for enzymes during cellular substrate metabolism inside the body. In addition to selenium, they hold superb levels of other minerals such as copper, magnesium, manganese, potassium, calcium, iron, phosphorus, and zinc. Copper helps prevent anemia and bone weakness (osteoporosis). Manganese is an all-important co-factor for the antioxidant enzyme, superoxide dismutase. Brazil nut oil, extracted from these nuts, has many traditional medicinal applications as an emollient and massage oil. It has clear yellow color with a pleasant sweet smell and taste. Its emollient property helps keep skin well protected from dryness. It has also employed in the cooking, and as “carrier or base oil” in traditional medicines in aromatherapy, in the pharmaceutical and cosmetic industry. Cashews are high in calories. 100 g of nuts provide 553 calories. They packed with soluble dietary fiber, vitamins, minerals and numerous health-promoting phytochemicals that help protect from diseases and cancers. They are rich in “heart-friendly” monounsaturated fatty acids like oleic, and palmitoleic acids. These essential fatty acids help lower harmful LDL-cholesterol while increasing good HDL cholesterol in the blood. Research studies suggest that the Mediterranean diet which is rich in monounsaturated fatty acids contribute to preventing coronary artery disease and strokes by favoring healthy blood lipid profile. Cashew nuts are abundant sources of essential minerals. Manganese, potassium, copper, iron, magnesium, zinc, and selenium are especially concentrated in them. A handful of cashew nuts a day in the diet would provide enough of these minerals and may help prevent deficiency diseases. Selenium is an important micronutrient, which functions as a co-factor for antioxidant enzymes such as Glutathione peroxidases, one of the most powerful antioxidants in the body. Copper is a cofactor for many vital enzymes, including cytochrome c-oxidase and superoxide dismutase (other minerals function as co-factors for this enzyme are manganese and zinc). Zinc is a co-factor for many enzymes that regulate growth and development, gonadal function, digestion, and DNA (nucleic acid) synthesis. Cashews are also good in many essential vitamins such as pantothenic acid (vitamin B5), pyridoxine (vitamin B-6), riboflavin, and thiamin (vitamin B-1). 100 g nuts provide 0.147 mg or 32% of daily recommended levels of pyridoxine. Pyridoxine reduces the risk of homocystinuria, and sideroblastic anemia. Niacin helps prevent "pellagra" or dermatitis. Additionally, these vitamins are essential for the metabolism of protein, fat, and carbohydrates at the cellular level. Further, they also hold a small amount of zeaxanthin, an important pigment flavonoid antioxidant, which selectively absorbed into the retinal macula lutea in the eyes. It is thought to provide antioxidant and protective UV ray filtering functions and helps prevent age-related macular degeneration (ARMD) in the older adults. Hazelnuts are very high in energy and loaded with many health-benefiting nutrients that are essential for optimum health. 100 g nuts carry 628 calories. They are rich in mono-unsaturated fatty acids like oleic as well as essential fatty acid, linoleic acid that helps lower LDL or bad cholesterol and raises HDL or good cholesterol. Research studies suggest that Mediterranean diet plentiful in monounsaturated fatty acids contribute to preventing coronary artery disease, and strokes by favoring healthy blood lipid profile. The nuts are rich in dietary fiber, vitamins, and minerals and packed with numerous health promoting phytochemicals. Altogether, they help protect from diseases and cancers. Hazels are exceptionally rich in folate, which is a unique feature for the nuts. 100 g fresh nuts carry 113 µg; that is, about 28% recommended the daily intake of this vitamin. Folate is an essential B-complex vitamin that helps prevent megaloblastic anemia, and most importantly, neural tube defects in the newborn. Good news for the expectant mothers! Hazel nuts are an excellent source of vitamin-E; contain about 15 g per 100 g (providing 100% of RDA). Vitamin-E is a powerful lipid soluble antioxidant required for maintaining the integrity of mucosa and skin by protecting it from harmful "free oxygen radicals". The nuts, like in almonds, are free from gluten, and therefore, safe alternative food sources that can be employed in the preparation of gluten-free food formulas for gluten-sensitive, wheat allergic, and celiac disease patients. Besides being rich in folates, they packed with many other important B-complex groups of vitamins such as riboflavin, niacin, thiamin, pantothenic acid, and pyridoxine (vitamin B-6). They are rich source of minerals like manganese, potassium, calcium, copper, iron, magnesium, zinc, and selenium. Copper and manganese are essential co-factors for antioxidant enzyme, superoxide dismutase. Iron helps prevent microcytic-anemia. Magnesium and phosphorus are vital components of bone metabolism. Hazelnut oil has a nutty aroma and has excellent astringent properties. It helps keep skin well protected from dryness. The oil has also been used in cooking, and as “carrier or base oil” in traditional medicines in massage therapy, aromatherapy, in the pharmaceutical and cosmetic industry. Pistachios are an excellent source of copper and manganese, and a good source of phosphorus. They are also an excellent source of vitamin B6, offering 20% of the Daily Value per serving. In addition to vitamin B6, pistachios are a good source of thiamin (15% DV) and have lesser amounts of other B vitamins, such as folate and biotin at 4% DV, and riboflavin, niacin, and pantothenic acid at 2% DV. According to the USDA Oxygen Radical Absorbance Capacity (ORAC) database, pistachios have a total antioxidant capacity of 7983 Trolox Equivalents per/100 grams, making them one of the highest in antioxidants among all snack nuts. While pistachios provide 14g of fat per 30g serving and almost 90% of that fat is the healthy unsaturated type, mono- and polyunsaturated. Monounsaturated fat, mostly as oleic acid, comprises 55% of the fat in pistachios. 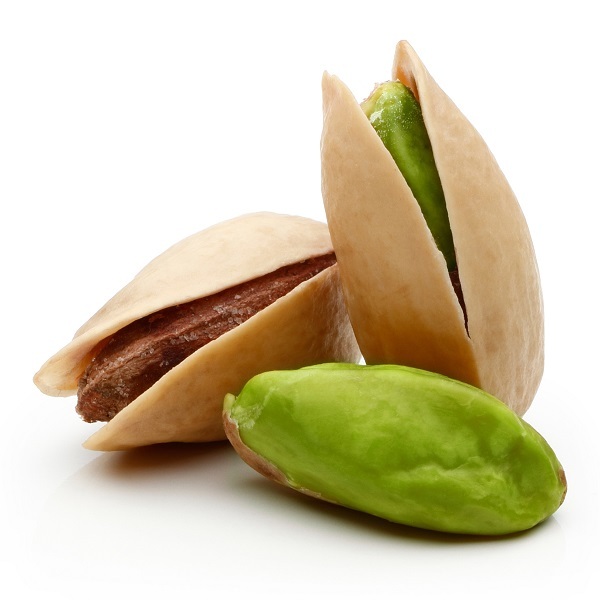 Polyunsaturated fat, primarily linoleic acid, comprises 32% of the fat in pistachios. Pistachios are naturally free from trans-fat. Walnuts are rich in heart-healthy fats and high in antioxidants. Additionally, regular consumption of walnuts may improve brain health and help prevent heart disease and cancer. These nuts are easily incorporated into the diet, since they can be eaten on their own or added to many different foods. Simply put, eating walnuts may be one of the easiest things you can do to improve your health. Walnuts are primarily made up of polyunsaturated fat. They contain a relatively high percentage of omega-3 fat, which has been linked with various health benefits. Walnuts are an excellent source of several vitamins and minerals. These include copper, folic acid, phosphorus, vitamin B6, manganese and vitamin E. Walnuts are one of the richest dietary sources of antioxidants. These include ellagic acid, ellagitannins, catechin and melatonin. Walnuts are a rich source of antioxidants and healthy fats. They may also reduce several of the risk factors for heart disease, especially when combined with other healthy lifestyle habits. Walnut consumption may lower the risk of certain types of cancer. However, further studies are needed before any solid conclusions can be reached. A walnut-rich diet may improve brain function and possibly slow the progression of Alzheimer’s disease. However, the evidence is limited and further human studies are needed. Walnuts are exceptionally healthy. However, some people may be very allergic to them. Walnuts may also reduce mineral absorption in some individuals.